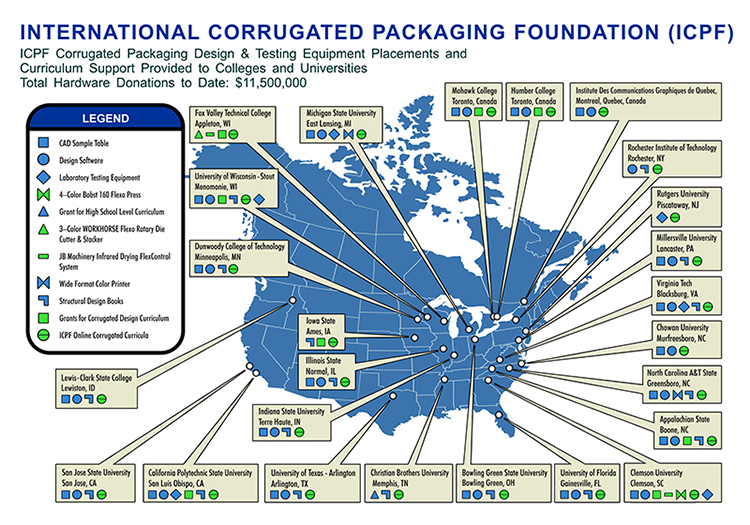 The International Corrugated Packaging Foundation (ICPF) works with colleges and universities across the country to expand corrugated curricula and to promote careers in the corrugated packaging & displays industry. In this regard, over the years ICPF has donated or placed equipment, software and other resources at numerous institutions of higher education. Much of ICPF's work today is to ensure that these assets are being fully utilized to produce the best corrugated education for students at ICPF's partner universities and colleges. If your firm is interested in making a tax deductible donation of a surplus, refurbished CAD Table or corrugated testing equipment, contact ICPF at rflaherty@icpfbox.org or call 703.549.8580. Following is a summary of ICPF asset placements and other curricula support.